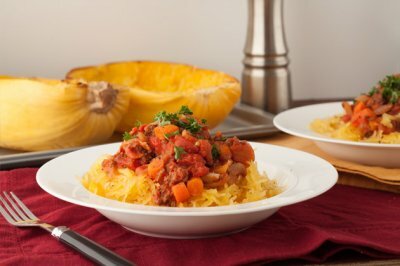 Spaghetti squash served with a homemade bison and bacon sauce. Saute coconut oil, onion, carrots, celery, garlic and dried oregano in a large saucepan on medium-high heat for 7 minutes. Add remaining ingredients except coconut milk and parsley. Bring to a boil, reduce heat and simmer covered for 45 minutes. Stir coconut milk into sauce right before completion. Place squash halves cut side down on a baking sheet. Cook in 350F oven for 35 minutes. 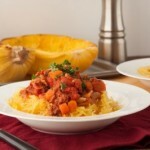 Scrape the insides of the squash with a fork to produce long strands of “pasta” and portion out into 4 bowls. Sprinkle with parsley and enjoy!